In High Nature Value areas, agriculture can ensure a suitable level of biodiversity by means of appropriate technological solutions. Extensive management methods facilitate conservation of the diversity of species and habitats, thus helping preserve unique landscapes with rich cultural and natural heritage. According to the estimates made in Slovenia on the basis of the CORINE data on land use and data on agricultural land use, between 60% and 80% of all utilised agricultural areas in Slovenia are located in High Nature Value farmland areas. These areas represent between 20 and 30% of the entire national territory, and to a large degree, their extent depends on the dynamics of agriculture intensification on one hand, and abandonment and overgrowing of agricultural land on the other. 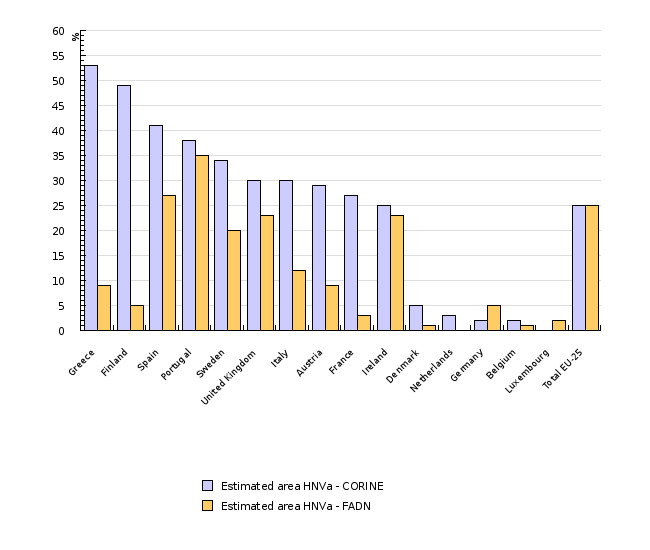 This indicator presents the share of utilised agricultural areas in high nature value areas (HNVA). farmland with the production of rare plant and animal species. The share of agricultural land in the above-mentioned types is determined by using various methodologies and data sources. The sources for the high nature value farmland areas from the first and the second indent are data on land use from the CORINE Land Cover database, combined with FADN farm accountancy data. 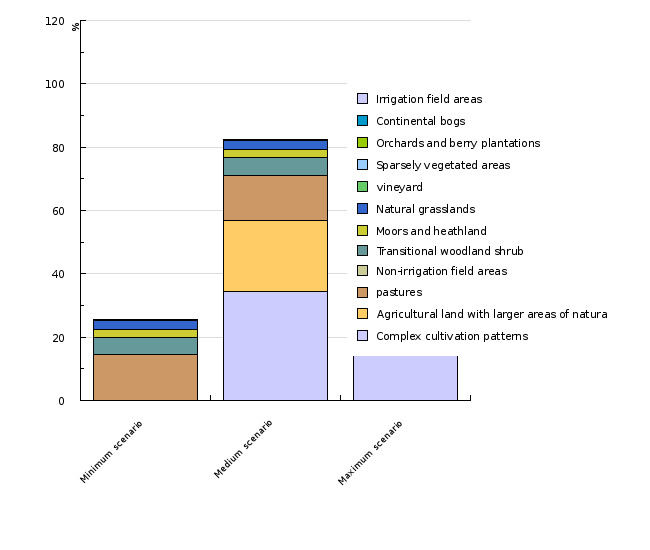 Data for the high nature value farmland areas from the third and the fourth indent are taken from databases on the propagation of individual plant and animal species. The indicator is complemented with indicators KM08 (Consumption of fertilisers), KM09 (Consumption of pesticides), KM32 (the state of landscape), KM33 (Impact on habitats and biodiversity) and KM35 (Impact on landscape diversity). The share of high nature value farmland areas in Slovenia is estimated on the basis of CORINE Land Cover data on land use from 2000. Since the secondary source data (FADN) is not yet available, we additionally used the estimate of the share of such areas based on the Agricultural Land Use Monitoring database established in Slovenia by the Ministry of Agriculture, Forestry and Food. The calculation of the shares for both data sources is based on three scenarios (minimum, medium, maximum). The average or medium scenario was selected as the most probable and most realistic with regard to the inclusion of individual categories of land. Agricultural Land Use Monitoring, Ministry of Agriculture, Forestry and Food, 2008; calculations by the Agricultural Institute of the Republic of Slovenia, 2008. CORINE Land Cover 2000, European Environment Agency, Environmental Agency of the Republic of Slovenia and Surveying and Mapping Authority of the Republic of Slovenia, 2003; calculations by the Agricultural Institute of the Republic of Slovenia, 2005. CORINE Land Cover 2000; Farm Accountancy Data Network, 2005. The need to introduce measures for the conservation of high nature value areas has long been clearly expressed in the EU legislation. The unquestionable development goal has been determined at the programme level in the EU Rural Development Policy. In terms of contents, the conservation policy can be divided into development measures for narrower areas and measures for wider high nature value areas. The first group includes measures for the conservation of biodiversity (bird and habitat directive), while the second group includes the remaining measures of common agricultural policy and rural development policy, particularly policies for faster development of less-favoured areas and agri-environmental payments. Slovenia will find it difficult to conserve the high level of biodiversity and prevent it from declining without additional incentives. High nature value farmland areas hold important opportunities to achieve higher biodiversity and protection of endangered habitats in individual rural areas. In general, they can be denoted as characteristic areas of extensive agriculture with great diversity of biological species and habitats. Due to its geographic position and diverse natural conditions, Slovenia ranks among the European countries with the highest degree of biodiversity. This also applies to agriculture, where natural conditions for the conservation of biological species and habitats are very favourable due to the prevailing use of grassland. The majority of high nature value farmland areas are located in western and southern Slovenia, particularly in the hilly and mountainous regions. • land categories in the Agricultural Land use Monitoring include extensive orchards, intensive meadows, extensive meadows, land under afforestation, riparian growth, bogs, rushes and other marshy land. 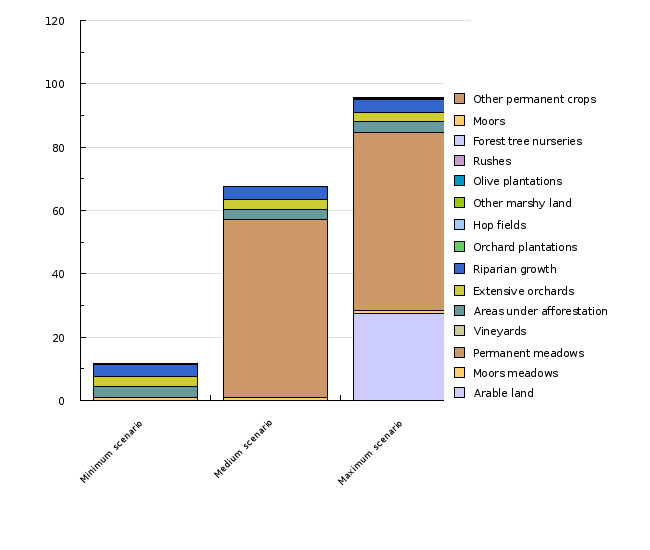 Various types of grassland and related land forms represent the largest share of high nature value areas. In Slovenia, distinctly dispersed and diverse land has an important impact on the extent of high nature value farmland areas. According to the CORINE Land Cover methodology, this land represents more than 40% of all high nature value areas. Determination of the share of farmland in the above types is based on the use of different methodologies and data sources. The source for the first two types of high nature value farmland areas (farmland with a high share of semi-natural vegetation and farmland with predominantly low-intensity agriculture or a mosaic of intensively cultivated land and land with semi-natural vegetation) is mostly the CORINE database on land use combined with the FADN farm accountancy data. The sources for the third type of high nature value farmland areas (farmland with a production of rare plant and animal species) are in most cases the databases on the distribution of individual plant and animal species. - in the framework of Agricultural Land use Monitoring – extensive orchards, intensive meadows, extensive meadows, land under afforestation, riparian growth, bogs, rushes and other marshy land.